Nothing highlights the dichotomy of Morocco as the assault on your sense of smell that the place offers. It’s not unusual to inhale the fragrant scent of mint as you pass a barrow of fresh herbs one moment and the pungency of freshly ground spices the next, while a stench of unknown origins will often follow as you walk the crooked streets of the country’s medinas. But it’s this contrast of smells, as much as sights, sounds and senses, that make visiting Morocco so compelling – no, exhilarating! 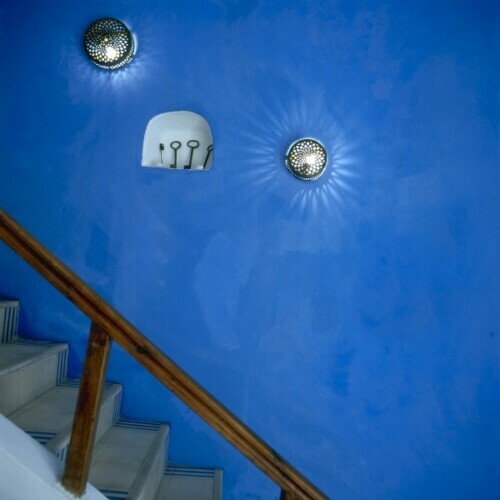 The laneway to Dar Lazuli, our HomeAway riad in Essaouira is no exception. The distinctive odour of ‘cat’s business’ from the felines who reside in our alleyway (whom we’d love to give a good bath), combine with the fantastic aromas permeating from the neighbours’ kitchens, both repelling and enticing us each time we return ‘home’. 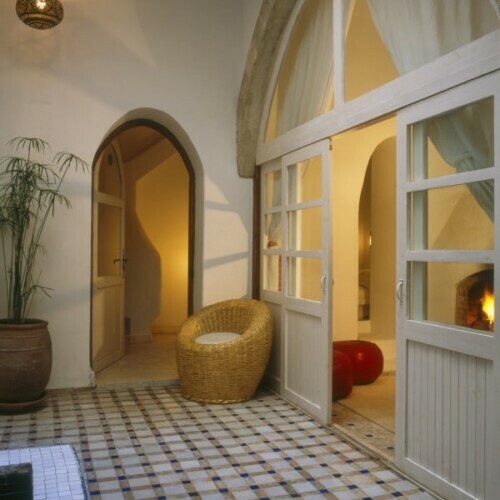 Holiday rental apartment, Essaouira, Morocco. 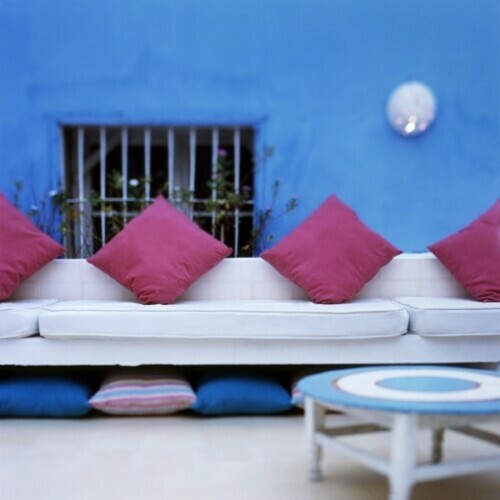 Holiday rental apartment, Essaouira, Morocco. Copyright 2014 Terence Carter / Grantourismo. All Rights Reserved. But don’t get us wrong – this is a good thing – smelling the roses of a fancy five-star is no match for a living-breathing neighbourhood if you really want to get beneath the skin of a place. 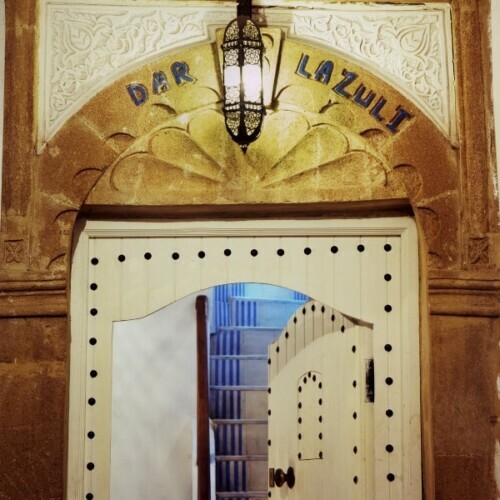 Once inside, anything unpleasant beyond that heavy old wooden door is quickly forgotten, for like all fine Moroccan riads, Dar Lazuli is a refuge of sorts, and the adorable apartments in the intimate, three-storey property serve as their own small sanctuaries. 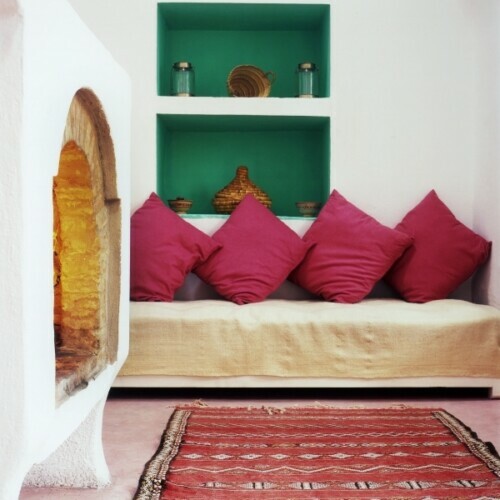 Cosy and cute, the four apartments are simply decorated in a rustic-chic style, with bold kilims, pared down Moroccan décor, and vibrant splashes of colour in bookshelves, nooks and cushions, to enliven the minimalism of the white walls and pebble or tile floors. Fireplaces and sheepskin rugs make the places especially comfy. A basket of wood and bellows are provided – which we’ve made good use of every night! 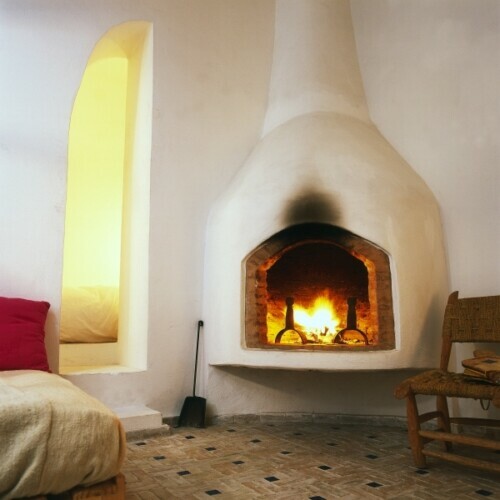 And when we’ve returned home after exploring the old town, we’ve discovered that Latifa, the housekeeper, has magically cleaned the fireplace so we’re ready to repeat the ritual when the temperature rapidly drops after the spectacular Essaouira sunset. 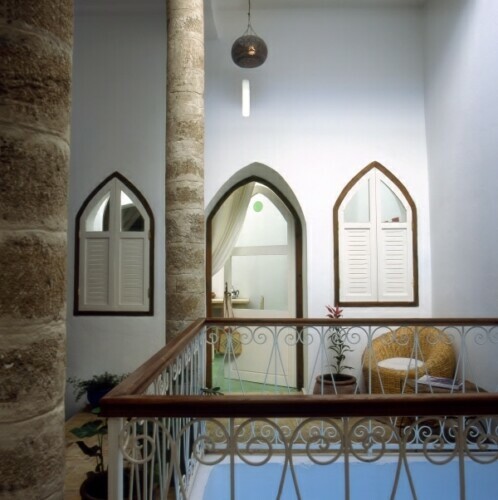 We’ve been staying in the ground floor apartment, which boasts a comfy sitting room, a compact kitchen, and a bedroom and bathroom accessed through glass doors off a central courtyard that’s open to the sky. While this has been wonderful when the sun is shining, it has meant we’ve tiptoed through tiny puddles of water when the rain poured heavily one night. It wasn’t really a drama and in a way it added to the sense that we were living in a real home in an everyday quarter of the old city. The other apartments (a tad brighter because they are higher) are spread over the two floors above, and there are two rooftop terraces with fascinating views over Essaouria’s old town rooftops. Each of the apartments is individually and delightfully decorated and in a way I was glad we didn’t have to decide between them. The main difference between our home in Marrakech, Dar Rocmarra, and Dar Lazuli, is the kitchen. At Dar Rocmarra, there’s one kitchen for the whole property and a cook is provided, and while Jamila in Marrakesh happy to give cooking lessons, it’s not like we could wander in at any time of the day or night to make ourselves a cup of tea or a snack. At Dar Lazuli, our kitchen is all ours, and it’s very well appointed, with an Italian coffee maker, plenty of crockery, cutlery, and kitchenware, including nice wine glasses and tajine pots, all of which Terry put to good use to perfect the tajine recipe that Jamila taught him in Marrakech. At Dar Lazuli, Latifa is also available to take guests shopping in the local markets, give them cooking lessons, and prepare dinner for them in their own kitchen. We found the focus on food at both properties very appealing. 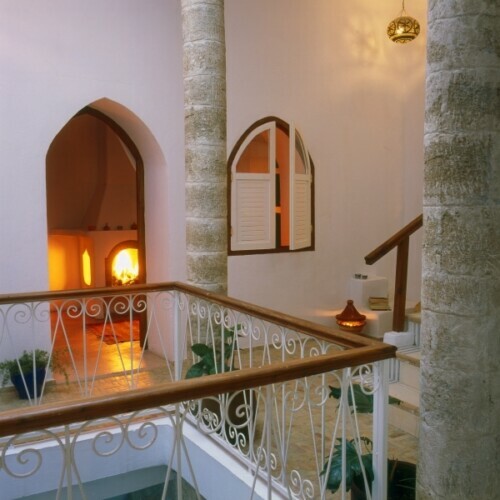 Whether you want to be able to cook yourself or have access to a talented local cook to do it all for you is probably what will ultimately help you decide whether to share a riad, rent your own, or rent an apartment in a riad. A riad is really the best way to go in Morocco – after our last two weeks, there’s no way we’d opt for a hotel again – no matter how good the roses smell.